What do you love about chamber music? How is it different from playing in a symphony? In the symphony we are always playing chamber music, just on a much larger scale. As a clarinetist, I am usually in partnership with individuals or pairs from the other wind and brass sections, or embellishing the sound of a section of strings (viola and cello share our lower range, violins the upper). Chamber music as our audiences will hear it at this concert is much more intimate for the players and the audience. We have the flexibility to communicate more freely visually, aurally, and through movement, to bend and shape lines and notes more spontaneously. It is wonderful to explore the texture and timbre Haley and I can create, and to work so closely with friends like her and Jonathan. How did you, Haley, and Jonathan join forces to create the ensemble Windsong? The music world is very small, and yet very large in Dallas. Musicians in the D-FW Metroplex have the good fortune of having many ensembles, organizations, and schools with which to work, many of which partner with each other. During a Christmas concert I played in 2014, I was (as our DMA audiences will be) enraptured by Haley’s beautiful voice and energy. I asked her if she would be interested in partnering together sometime, and my friend Jonathan agreed to join us for a recital in spring of 2015. We perform several times a year now, expanding our repertoire; we are excited to share this diverse program with DMA audiences this weekend. You and your husband also perform together as the Korevaar Duo with David on piano. What is it like working with your spouse? Interesting you should ask this! David and I are both so busy we don’t get to play together often. We generally have a good affinity for working together and have explored and performed much of the standard duo repertoire. We just gave the world premiere of Mike Barnett’s Ultraque Unum at Colorado University-Boulder, a piece Mike wrote for our wedding. This contemporary piece has many jazz elements and is quite challenging in both the individual parts and ensemble. The process of working through performances in duo and chamber settings both reinforces what we’ve always known about each other and gives us new ways to understand, appreciate, and enjoy each other. In the case of chamber music, we also enjoy extending our wonderful circle of friends while creating a soundscape for our audiences. How old were you when you started playing clarinet? Why did you choose that instrument? I taught myself piano and began lessons on that instrument prior to choosing clarinet in fourth grade as a band instrument. I would have liked to have played cello, but the instrument was too big to carry or bike to school. As an alto, I think I was attracted to the middle range of both instruments. I also have an affinity for shiny metal and expect I was attracted to all the shiny keys on the clarinet – my mom should have named me Crow! What types of music do you share with your kids? What type of music do they like? My parents both enjoyed music and had broad tastes, and I like to hear new bands my kids are listening to (including “clean” dub step, rap, rock/folk rock) as well as sharing with them classical music from all periods and classic rock from the ’70 and ’80s. I’d like to take them to the opera – we’ve not done that yet. I’m not sure the boys share my love of Celtic music, but we all appreciate jazz. 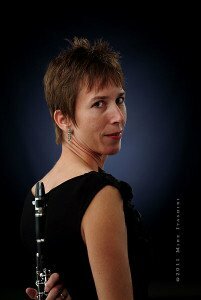 For amusement, my older son (who plans to major in clarinet performance) and I will sometimes whistle the beginning of clarinet excerpts, which my younger son will then complete (he is not a clarinetist but knows the repertoire well, having four other family members who play the instrument). Who’s your favorite composer to listen to? To play? In both cases I would have to say Brahms, followed by Mozart. Any piece of Mozart that I play is “just right,” even if I only have a supporting line – his writing is impeccable. Brahms fully explores the depths of the human heart and spirit in the most elegant counterpoint. I appreciate his writing both intellectually and emotionally. What’s your favorite sound (musical or non-musical)? Least favorite? The first thing that comes to mind is my boys whistling when they are cheerful, followed by hearing their creative expression when playing their instruments (clarinet, guitar, bass guitar). My least favorite sound is definitely fluorescent lighting – the new lightbulbs are not something I can tolerate well. Once you leave this world and reach the pearly gates, what celestial concert are you looking forward to? While I would love to hear [clarinetist] Daniel Bonade and [clarinetist] Robert Marcellus play “live,” I would prefer to use my release into the spiritual world to explore the many different types of folk music from around the world. Scotland, Ireland, Appalachia, and Japan top my list. 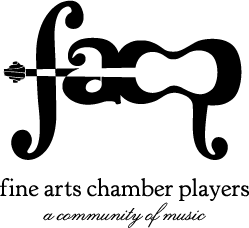 Fine Arts Chamber Players presents its FREE Bancroft Family Concert on Saturday, April 2, 2016, at the Dallas Museum of Art featuring the ensemble Windsong: soprano Haley Sicking, clarinetist Robin Korevaar, and pianist Jonathan Tsay. The trio performs works by a range of composers: Arnold Cooke’s Three Songs of Innocence, with text from William Blake’s Songs of Innocence and Experience; Ralph Vaughan Williams’ Three Vocalises for clarinet and soprano; selections from Charles Gounod’s Faust and Romeo and Juliet; arias by Giacomo Puccini and George Frideric Handel; and an excerpt from Gustav Mahler’s Symphony No. 4. Horchow Auditorium doors open at 2:30 p.m. for the 3 p.m. concert. The museum is located at 1717 North Harwood, Dallas, TX 75201. As always, admission to the concert is free with no reservations or tickets required. For more information, visit www.fineartschamberplayers.org. 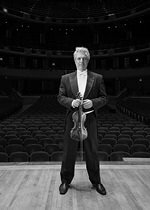 Gary Levinson serves as Senior Associate Concertmaster for the Dallas Symphony Orchestra. He, along with six other musicians, a narrator, and a conductor, will perform Igor Stravinsky’s L’Histoire du soldat (The Soldier’s Tale) at our free Bancroft Family Concert this Saturday. The concert, in the Horchow Auditorium at the Dallas Museum of Art, begins at 3:00, with doors opening at 2:30 for the performance. Mr. Levinson took the time out of his busy schedule as violinist/husband/father to answer our questions for you! What excites you about Stravinsky’s L’Histoire du soldat you’ll be playing on March 12? I have played this work probably 100 times. However this year I’ve also done the suite which is arranged by Stravinsky for clarinet, piano, and violin. I’m excited to share the full version with my DSO colleagues and the FACP audience at the DMA. What is your history with this piece? When did you first perform it? I was first encouraged to explore this work by Zubin Mehta, the music director of the New York Philharmonic, who gave me my first job out of school. It was an incredibly intimidating experience since everyone I worked with had done it many times and it was my first time – but one of my great memories was working on the piece with Chris Lamb, principal percussionist of the New York Philharmonic. I remember going into his studio and picking out the different instruments for the various dances. It was like being in a lab getting all of the ingredients for the music just right and I find that incredibly exhilarating. What do you love about chamber music? How is it different from playing in a large symphony? I love the give-and-take one has when you have a great piece of chamber music. There’s a different level of trust and energy which translates to the audience. This chamber selection is special in that it calls for a conductor and a narrator. Is it a challenge to add these additional elements, or does it flow naturally? Like many Stravinsky scores, L’Histoire is extremely complex rhythmically and texturally. I find the additional elements very natural and necessary for everyone’s confidence. What types of music do you like to share with your kids? What type of music do they like? I share all music with the kids. In our family because both of us are professional musicians there is a kind of a kaleidoscope of music in the house. So when they come home they may hear Paganini caprices upstairs and Schumann Humoresques downstairs. They like everything from opera to rap. But I’ve never had to ask them to sit down and listen to it. I’ve also never blamed them if they dislike a certain part of the work or even the entire work. It’s been really fun trying to discover which works they like and why they like them. They like expanding their horizons when it to comes to both classical and popular music. Who’s your favorite composer to listen to? To play? Whomever I need to perform next. What’s your favorite sound (musical or non-musical)? Least favorite? My favorite is the great recording of a young Misha Elman playing the Tchaikovsky violin concerto. It’s the most human that a violin can sound. Close second is the sound of a Ferrari engine. Least favorite is the sizzle of tofu. Once you leave this world and reach the pearly gates, what celestial concert are you looking forward to? (i.e. Bach at the organ, John Lennon at the piano, etc.) Heifetz playing in the Mendelssohn octet – I wonder if he still would claim everyone else is too loud.